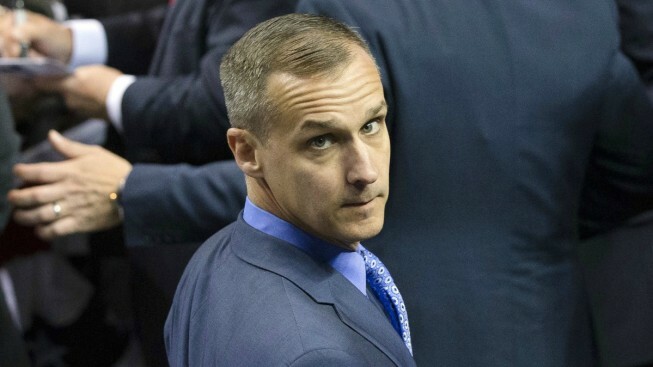 In this April 18, 2016, file photo, Corey Lewandowski, former campaign manager for Donald Trump, appears in Buffalo, N.Y. Singer Joy Villa has accused Lewandowski of harassment. Former Trump Campaign manager Corey Lewandowski is accused of sexual misconduct by a pro-Trump singer who posted about the encounter on social media. Joy Villa, who gained attention for wearing a Trump-themed "Make America Great Again" dress to the 2017 Grammy Awards, shared a photo on Twitter Friday of her posing with Lewandowski. Villa said Lewandowski slapped her buttocks, and after she told him to stop, Villa said he slapped her again. "Corey laughed in my face and ran away," Villa told Politico, which corroborated Villa's account with a witness. "It felt like it was all a big joke to him." The two were attending a November party at the Trump International Hotel in DC celebrating the President Donald Trump's first year in office, Politico reported. It was an invite-only party, and it was attended by people who were part of the 2016 race. The singer, who is exploring a possible congressional run, said she was worried about telling her story for fear that Lewandowski could retaliate. "I thought, 'What if this messes up my chances.' He has power and influence, and he's close with the president, who just tweeted about his book. I wanted to play it safe and avoid the drama," Villa said. Lewandowski remains in Trump's close circle, and he recently published an inside look at the campaign, titled "Let Trump Be Trump: The Inside Story of His Rise to the Presidency." Politico said it reached out to Lewandowski for comment but did not receive a response. And NBC's request for comment from Lewandowski was not immediately returned. Villa added that she was motivated to tell her story by other women sharing their stories of harassment.